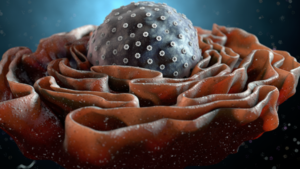 Among the multitudes of eukaryotic viruses with DNA genomes, some replicate in the cell nucleus, while others avoid the nuclear bureaucracy and remain in the cytoplasm. But biology is not always so rigid: a new giant virus has been found that replicates in the cytoplasm, where it seems to recruit components of the nuclear transcription machinery (link to paper). Noumeavirus was isolated from a pond near – where else? – Noumea airport in New Caledonia. The 200 nanometer icosahedral particles infect the amoeba Acanthamoeba castellani and have a double-stranded DNA genome of 376,207 base pairs encoding 452 proteins. Sequence comparisons revealed Noumeavirus to be a new member of the family Marseilleviridae, which includes other previously discovered giant viruses. Other members of the Marseilleviridae replicate in the cytoplasm of the host cell, so it was assumed that the related Noumeavirus would do the same. However an analysis of the proteins in purified virus particles revealed an absence of components of the transcriptional machinery – which is needed for ths synthesis of mRNA. RNA polymerase, for example, is readily detected in other cytoplasmic viruses such as Mimivirus and poxviruses. If proteins involved in transcription are not present in the Noumeavirus particle, and the virus does not enter the nucleus, how are viral mRNAs produced? It appears that early in infection, the required proteins are moved from the nucleus to sites of viral replication in the cytoplasm. When nuclear proteins were labled with green fluorescent protein, within one hour after infection they can be seen moving out of the nucleus into the cytoplasm to sites of viral replication. The nuclear integrity remains intact, as host DNA does not leave the organelle. This recruitment of nuclear proteins is transient: after 2-4 hours proteins are no longer leaving the nucleus. Confirmation of this hypothesis will require the demonstration that nuclear proteins involved in viral mRNA synthesis are recruited to early sites of viral replication in the cytoplasm. It will also be essential to identify the mechanism by which these nuclear proteins are extracted. Perhaps one or more virion proteins, such as an abundant 150 amino acid protein of unknown function, is involved. Other giant viruses, such as Mimivirus, package the viral transcriptional machinery in the virus particle and are independent of the cell nucleus. At the other extreme are viruses that undergo transcription and DNA synthesis entirely in the nucleus (e.g., herpesviruses). Perhaps Noumeavirus is a relic of an evolutionary transition between the two replication strategies.